I talk a lot about how great it is to connect with other authors over social media, how the online community makes it so easy to be alone physically but never alone virtually. And that is all true. However -- and it's a big however -- there's really nothing like meeting other authors in person and spending time with them. I got to meet Lynda Cohen Loigman when we were both part of one of the Twin Cities' amazing Lit Lovers events, orchestrated by the even more amazing Pamela Klinger-Horn of Excelsior Bay Books. And Lynda and I instantly clicked, cementing fellow-author camaraderie and friendship over a mere few hours of good food, wine, and book talk. Are author friends online great? Yes. Is it even greater when in-person author friends become online author friends and vice versa? You betcha. A full year later, we were both delighted to discover that our next books were announced on the same day in Publishers Marketplace. And since both of those books are publishing next spring, we may just find ourselves meeting in person on the road again. Hope so! Lynda: For me, inspiration has always come from the women in my family. It has been more than ten years since my mom passed away, but whenever she and her two younger sisters got together, they loved to tell stories about their childhood in the 1950s. 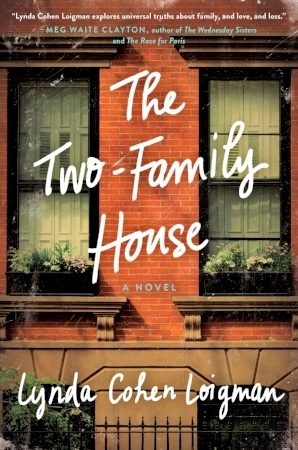 Like the families in my first novel, they grew up in a two-family house in Brooklyn, New York. They lived on the top floor, while my grandmother’s brother, his wife and their three daughters lived on the bottom. When I was young, I couldn’t imagine anything more fascinating than the life my mother and her sisters led in Brooklyn. They told me tales about their trips to the doll hospital in Manhattan, they spoke in hushed tones about the time my mother lost her younger sister on the subway, and they burst into laughter every time they repeated the story about my mother’s first date – when she wore a girdle and a slim black pencil skirt to the neighborhood tennis court. Those stories, and so many more, were the food of my childhood. They are so rich with details and so full of emotion that I find myself returning to them whenever I sit down to write. It’s always my hope to create characters for my readers who feel like people they have known from their own families. The intimacy and the warmth I felt listening to my aunts’ stories is something I strive to duplicate. Lynda: In December, I read J. Courtney Sullivan’s Saints for All Occasions, a gorgeous novel about two sisters who leave Ireland for Boston in the late 1950s. Although I am always partial to family sagas, this one is special. The characters Courtney Sullivan creates are so intricate and layered, and the relationship between the sisters – with secrets, grudges, love, and regret – is more real than anything I’ve read in a very long time. One of the best gifts an author can give to readers is a feeling of inclusion and immersion in the world she creates. I truly felt that as I was reading this book. Greer: What’s your next book and when will we see it? Lynda: My next book is about two estranged sisters who are raised in Brooklyn and relocate to Springfield, Massachusetts at the start of World War II. The initial inspiration for the story came, once again, from my mother’s family, who moved from Brooklyn to Springfield in the late 1950s. But the sisters in the novel come to Springfield much earlier, and both live and work at the historic Springfield Armory. As part of my research, I visited the Armory and listened to the oral histories of former female employees. I learned that what I had envisioned as nothing more than a giant weapons factory was actually a bucolic campus filled with elegant homes and manicured gardens. When the story opens, the sisters have been estranged for five years. Their reunion is not an easy one, and after long-buried secrets are revealed, it is unclear whether their bond will be strong enough to survive. The novel tells the story of subtle and complicated family relationships, but it also highlights the fascinating careers of the women’s ordnance workers who worked as “soldiers of production” for our country. The title is The Wartime Sisters, and it will be published in January of 2019. Lynda: My question for you is this: Your first two novels (and your third, which sounds amazing, so kudos!) fall firmly into the category of historical fiction. Do you every see yourself veering into a different genre, or is there something about either your interests or your writing process that makes you want to continue writing these stories? Every time I try to write, I end up somewhere in the past. Writing a story with a contemporary setting feels impossible to me. What about you? Greer: It's funny. I wrote contemporary for years and years before finally getting published with The Magician's Lie, and it felt hard at the time, but now that I'm exclusively writing historical, contemporary seems so easy from a logistical standpoint! To be able to give someone any haircut I want, any clothes I want, to be able to walk down a street and just put those things into a book -- what a luxury. That's my first impulse, anyway. But the truth is that most of the ideas that come to me now are historical. Research turns up so many more inspirations than I could ever possibly write. It's possible to write a present-set story that has stakes as high as a historical novel, but somehow, the stakes feel higher to me in the past. When I read books that have one contemporary thread and one thread set in the past, the past thread almost always feels more urgent, more meaningful. So I just write mine without the contemporary thread. I jump around in time, but the time is always past, not present. To connect with Lynda on social media or learn more about her books, check out the links below.